Also Recommended: Kuuchuu Buranko and anything else done by Masaaki Yuasa. Notes: Based on a novel by Tomihiko Morimi. This series ran on Fuji TV's noitaminA block from April through July 2010. We watch an unnamed protagonist live his university years over and over again with different 'what if?' beginnings to each - trying to find which choices will allow him to achieve a perfect college life. There is one clear downside to being an animé reviewer that even one as new as I cannot miss and definitely cannot ignore. We watch too much animé. I find myself wondering how many more tsundere lolitas must I hear Rie Kugimiya voice? How many spineless wimps must I watch running away from implausibly (closer to impossibly) cute admirers for pretty much no reason whatsoever? How many shows must I watch that consist of cute girls doing cute things with personalities that are little more than a few jotted down words on the back of a napkin before a series pitch, at best? I have sympathy for my seniors for what they have had to put up with in the line of duty and with you, the viewer for your own war with mediocrity. We put up with it, though, for those moments when the clouds break, we see the sunlight for a brief moment through the grey haze and we remember why we love this medium so, so much - we remember that first show that opened our minds to this wonderful world and why we tolerate it though it disappoints us so often. Some shows remind us why we watch animé. The Tatami Galaxy is one of those shows. From its first onslaught of verbiage to its glorious end, we face one of the most brilliantly realized television programs to have ever graced our screens. In the leagues of Haibane Renmei and Princess Tutu, we see director Masaaki Yuasa finally scoring the goals that those of us who have watched his previous works suspected he could but had previously missed through a lack of focus and a bit too much self-indulgence. This time, however, he does not take his eye off the ball. A running thread throughout his work, a seam that brings all his work together no matter how diverse it can be, is his sense of humour. From the bizarre presence of the martial arts monkey in Kemonozume to The Tatami Galaxy's god eating at the ramen stand, we are confronted with oddity and strangeness that could lie anywhere between morbid and plain silly. The whole premise of this show is blackly comic as we watch our nameless protagonist amble around mistakes and indecision, building our sympathy and our amusement together as one as he hopelessly fights the course of his life, trying to get the girl and fulfil his dream of a 'rose-coloured campus life'. The laughs and the drama together build on our own understanding of the events that, while extreme and often almost silly, resonate like the truths they are. Yuasa is an observational comic - he does not rely on gags, puns, or in-jokes to amuse us but instead entertains us by giving us a ridiculed reflection of our own, often messed-up lives. That is the strength of The Tatami Galaxy. Each character is, in an odd and extreme way, someone that we know. Ozu is that person who is always getting us into trouble; Akashi is that person you just do not have a chance with, or so you think. Whatever you see in the characters (it may be different from me), they are characters you can fit your own world around and that is not to say they are shallow placeholders - not at all. Real people have depth, even the shallowest ones, and these characters have the depth you would expect a real person to have: they have pasts, dreams, thoughts, relationships and not just for the sake of the narrative. The exploration of this depth is also equally as expert. Though each episode technically covers the same space of time, this is no Endless Eight (if you don't know what I mean by that then lucky you). Each episode shows different situations from different sides, the protagonist's choices bringing him closer to one character at one point and closer to another in a different episode. For example, we are not shown Ozu's schemes as a whole in any of the episodes - the information, the little changes made by the protagonist's different choices, building together to form a whole story over the eleven episodes. 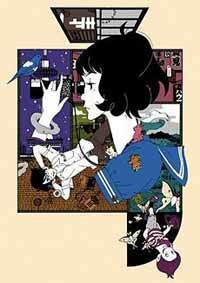 Even repeating itself, The Tatami Galaxy forms one story by telling the same story repeatedly, like a diamond viewed from every side - letting us see its depth and brilliance. I haven't even talked about the art, have I? If Yuasa has a signature style, I would have to call it 'unique' as in every production he makes is utterly incomparable to almost anything else. The Tatami Galaxy looks like nothing Yuasa has made before; the character designs are far more reserved and realistic, though maybe only in comparison to his other works. They are definitely smoother and more refined compared to the sketchy sharpness of Kemonozume or the bubbly rounded look of Kaiba. The only thing they have in common is how appropriate they are to the tone and setting of their respective shows and The Tatami Galaxy is pitch-perfect with this as has always been the case with Yuasa. The muted colour palette is once again spot on and often lusciously dark. It just looks right. I feel, however, that amongst all this gushing praise, I should talk about flaws but there are honestly very few. Some people have complained about its fast-paced speech, which requires some fast reading, but it was no problem for me, personally, and like many shows with real depth, it requires some thought to put together though nothing to the level of shows like Mouryou no Hako or even Monster. I suppose there is a chance that it might not resonate with you (it seriously draws from our experiences in order to relate to us) but I honestly believe that anyone who has been to college or university will be able to find some grain of truth, wit or nostalgia to amuse yourself with in this series. Try it and see. There are certainly very few more interesting or unique animé out there and perhaps even fewer this well delivered. Recommended Audience: Teens and above. Not much is actually objectionable but it will go way over the head of anyone younger, most likely. To be honest, it's the college kids or post-college kids that are really going to get a lot out of it.